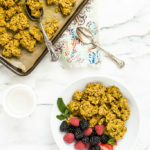 These vegan golden turmeric granola clusters have a vibrant yellow hue, so vibrant, in fact, that I actually had to desaturate the photos to avoid blinding your pretty peepers. In addition to their golden glow, they’re sweet and nutty with the most tender, life-changing crispness that is neither too crunchy and lacquered nor too delicate and crumbly. Rather, their crispness strikes the harmonious sweet spot in between, yielding clusters that hold together like a dream yet melt in your mouth with a mere chomp or two. Serve these clusters with fresh berries, a splash of ice-cold almond milk, or over creamy vanilla-kissed coconut yogurt. 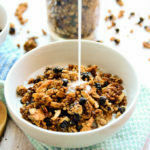 As I was planning out blog recipes a few weeks back, I realized that it’s been almost nine months since I shared a granola recipe. What the what? Even more alarming was the realization that I hadn’t even made granola during those nine months. As a self-diagnosed granola addict, I’m a little unclear where things went awry, so I’m breaking the granola drought with my second favorite granola recipe ever (my #1 favorite will be revealed in the book). 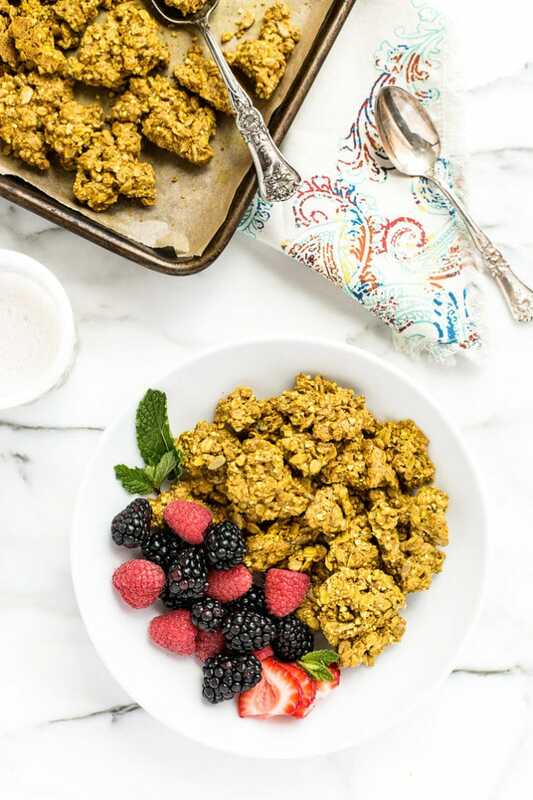 These golden turmeric granola clusters have a vibrant yellow hue, so vibrant, in fact, that I actually had to desaturate the photos to avoid blinding your pretty peepers. In addition to their golden glow, they’re sweet and nutty with the most tender, life-changing crispness that is neither too crunchy and lacquered nor too delicate and crumbly. Rather, their crispness strikes the harmonious sweet spot in between, yielding clusters that hold together like a dream yet melt in your mouth with a mere chomp or two. 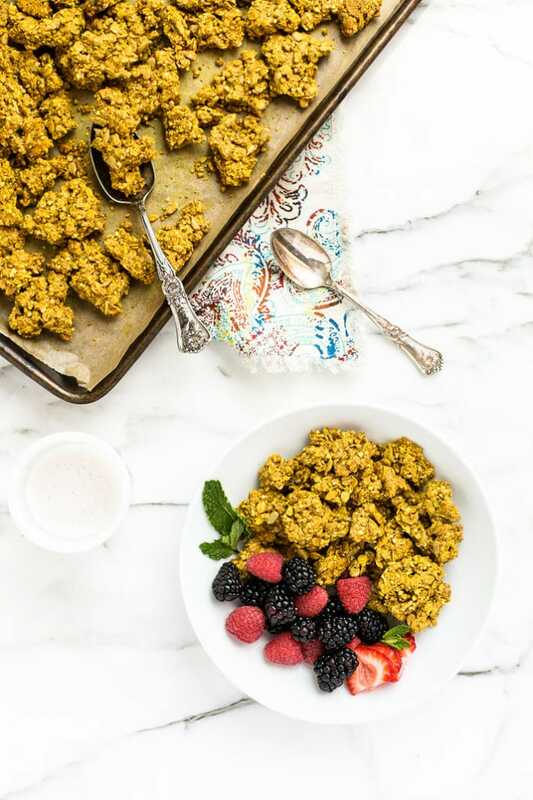 These clusters are made using the same method as granola recipes I’ve shared in the past, such as the Blissful Blueberry + Buckwheat Granola or the Dried Cherry, Sunflower Butter + Buckwheat Granola. 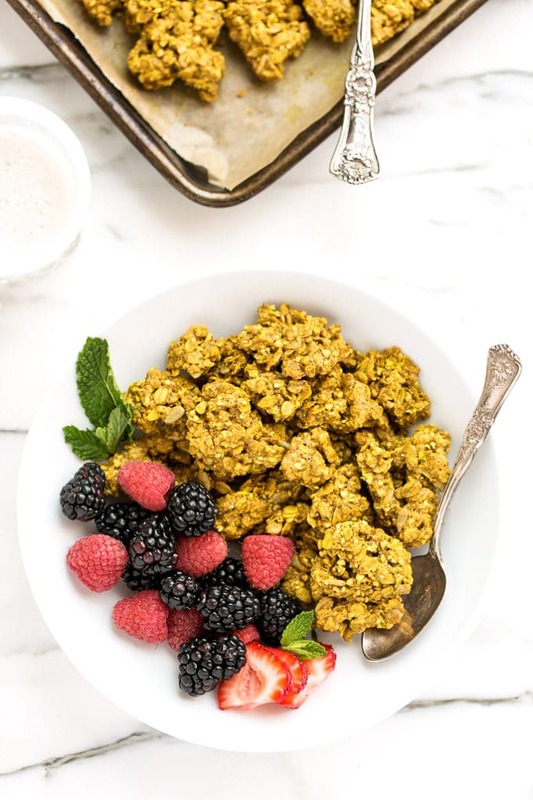 The only difference is that a portion of the oats and a 1/2 cup of raw almonds are ground into a meal that binds the granola together into those lovely clusters. Oh yes, and a lower temperature (275F) is used to encourage slower baking, thereby offering more cluster-y goodness. As you’ve probably gathered, the rich yellow-orange hue in these clusters comes from turmeric. Turmeric, a root-derived spice, has been praised for its anti-inflammatory properties for centuries. Its bright pigmented color comes from curcumin, which is believed to be the spice’s primary anti-inflammatory agent. 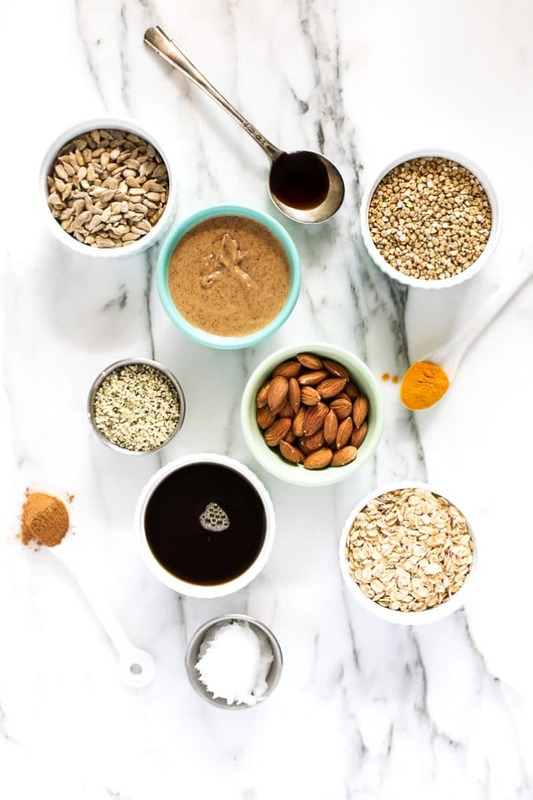 Recent research studies have demonstrated negative correlations between curcumin consumption and the rates of certain types of cancer, meaning that as curcumin consumption goes up, cancer rates go down. Of course this doesn’t necessarily imply causation, rather, it suggests that these two variables appear to be connected in some way. If consumed by its lonesome, turmeric has a subtle peppery flavor with a mild warmth, but I find that its flavor mellows even further when it’s paired with other spices, seasonings, etc. Point being, even with two tablespoons of the stuff being woven throughout these clusters, your greatest indication it’s there will be its lingering color. 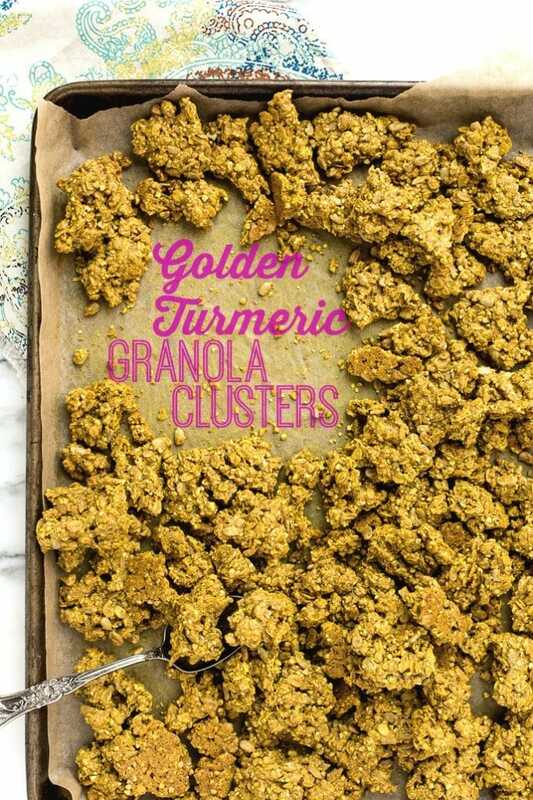 So if you happen to be turmeric-averse, this granola might just sway you to the golden side. And here’s a smooth and ethereal tune to serenade your granola bakin’ and snack makin’—thanks to Dan and his brilliant ears for scouting this one out. 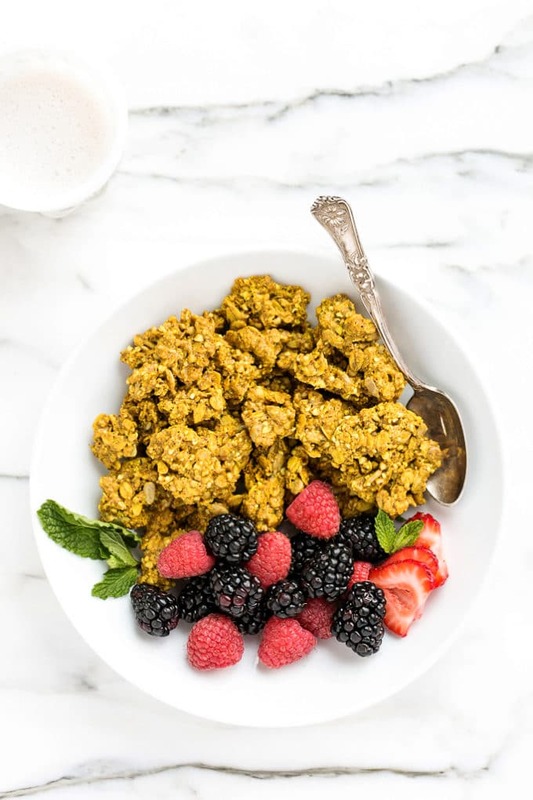 These golden turmeric granola clusters have a vibrant yellow hue, so vibrant, in fact, that I actually had to desaturate the photos to avoid blinding your pretty peepers. In addition to their golden glow, they're sweet and nutty with the most tender, life-changing crispness that is neither too crunchy and lacquered nor too delicate and crumbly. Rather, their crispness strikes the harmonious sweet spot in between, yielding clusters that hold together like a dream yet melt in your mouth with a mere chomp or two. Serve these clusters with fresh berries, a splash of ice-cold almond milk, or over creamy vanilla-kissed coconut yogurt. Preheat oven to 275F and line a large baking tray with parchment paper. Add 1/2 cup of the rolled oats and the almonds to a food processor and process for 1 minute or until the texture resembles a coarse flour. Transfer to a large mixing bowl and add the remaining 1 1/2 cups of rolled oats, sunflower seeds, buckwheat groats, and hemp seeds. Use a large wooden spoon to mix. In a medium saucepan, whisk together the almond butter, maple syrup, coconut oil, vanilla, turmeric, cinnamon, cardamom (if using), and sea salt over low heat for 3 minutes or until smooth and glossy. Pour over the oat mixture and get stirring. 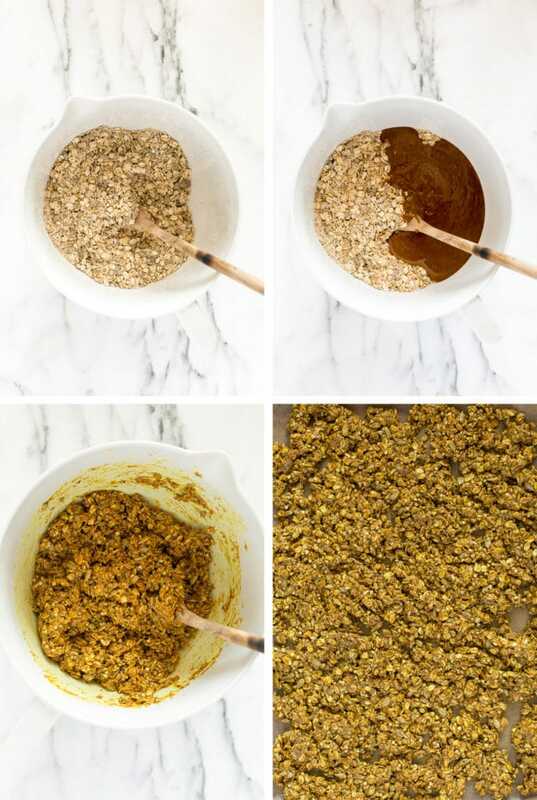 Once every bit of the granola is evenly-coated, turn it out onto the lined baking tray and use the back of a spoon or spatula to spread it out into a 1/3-inch-thick layer across the pan. Bake for 15 minutes, rotate the pan back-to-front, and bake another 20 to 26 minutes. The granola is ready when it's wafting a toasted scent, the top is a very light golden-brown, and it feels firm but not yet crisp to the touch. 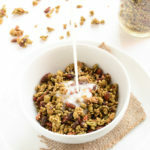 Note: Granola doesn't become crisp and crunchy until it's had a chance to cool, so rely on look and scent more than touch or you'll end up with burnt granola. 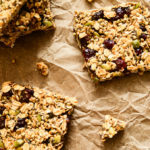 Once the granola is ready, remove the pan from the oven and place it on an oven-safe cooling rack to allow air to circulate beneath and around the pan to efficiently cool and crisp the granola. Serve over coconut yogurt with fresh berries, enjoy with generous splash of cold almond milk, or snack on the clusters straight from the jar. 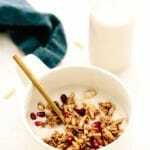 *Oats are naturally gluten-free but are prone to cross-contamination in processing/packaging. If you're gluten-sensitive, use certified gluten-free oats to be on the safe side. **Raw buckwheat groats are white and green. Do not use pre-toasted buckwheat (aka "Kasha") as it has a very different flavor. I’m right there with you in the granola addiction!! I make it so often and then I to realize I don’t share all the recipes I have very often! That always seems to happen with the “common-to-us” recipes! 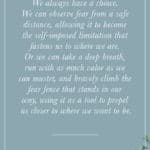 So true!! 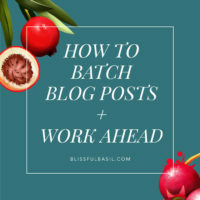 When I make a recipe over and over again, I often worry that it’s not “special enough” to be shared on the blog. In reality, when I have shared those “ordinary favorites”, they’re often the most beloved by readers. Turmeric is a wonderful thing. As I am trying this I’m sipping on a Turmeric Lemonade. Over the past few months of including Turmeric in my diet everyday, I have had a nagging shoulder pain disappear. It really is, isn’t it? That’s amazing about your shoulder pain disappearing, Celeste. Who knew a dash of golden spice could work such wonders? Hi Ashley, I absolutely love your other granola recipes but I’ve never tried granola with tumeric. 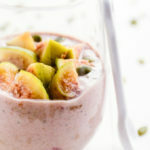 Can add-ins like coconut or blueberries still be used or would it not work with these flavors? 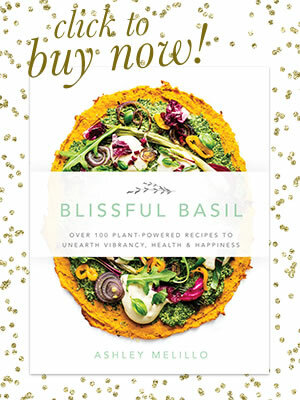 Thank you for all your wonderful recipes & congrats on the book! Hi, Toni! I’m so sorry for the MAJOR delay in my reply. I think dried blueberries and coconut would be great additions. The turmeric flavor is subtle enough that it will pair well with a range of additions. Thanks so much for your patience and kindness! WoW!! These are amazing???????? i made a double recipe and gave some away as gifts ???? Thanks, Eileen! 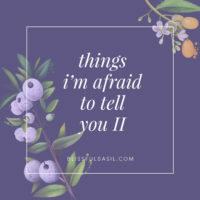 So glad you enjoyed them and great idea to give some away as gifts! I got to taste these yesterday…thank you very much! and have my own private stash which I plan to share with my husband …but that might not happen seeing he is out of town and I am tempted every time I see them. So glad you’re enjoying the recipe, Miranda! Thanks for taking the time to come back and share your feedback as well as your adjustments. 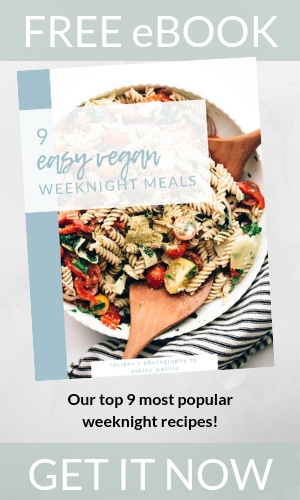 It’s great to know that red quinoa works as a substitute for the buckwheat groats—never would have thought that would work, but now I can’t wait to try it! What a fantastic find- YUM! 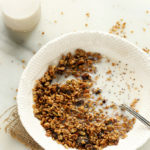 I have made this granola twice already in the last week and am just writing a shopping list now to try some of your other recipes.